Gary Griffin’s second visit to the park illuminates Sondheim’s portrait of the artist(s). The conventional wisdom on Sunday in the Park with George is that its first act is a self-contained marvel and its second a bemusing, contrived and immediately dated coda. As a Sondheim fan who’d never seen a full live staging of Sunday, I’d accepted the received opinion that the show was shaky at best. I was too young to have seen the original production, which transferred to Broadway in 1984 with stars Mandy Patinkin and Bernadette Peters, and I missed director Gary Griffin’s previous staging at Chicago Shakespeare’s small upstairs theater in 2002. None of the limited versions I’d experienced up to now—the 1984 cast recording, the videotaped edition of that production that was made for television or the bare-bones 2004 concert staging at Ravinia that starred Michael Cerveris and Audra McDonald—had made good sense of the chromolumes, which both onscreen and in Highland Park came off like goofy precursors to a Pink Floyd laser-light show. 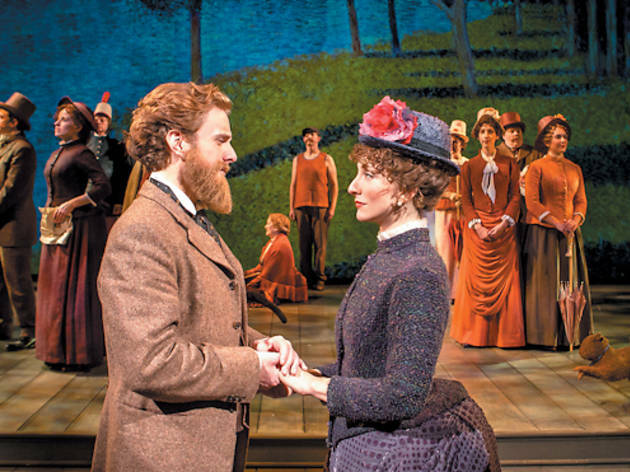 Nor did they really justify the play’s too swift and facile denouement, in which 20th-century George encounters his long-dead great-grandmother, Seurat’s lover, Dot, and has an ill-defined artistic epiphany. Griffin’s new revival in CST’s larger Courtyard Theater, though, uses every paintbrush Sondheim and Lapine provided and then some. Jason Danieley’s Seurat is an artist at an intense remove from his world, blessed with new ways of seeing the light and colors around him but cripplingly unable to engage emotionally. “I am not hiding behind my canvas; I am living in it,” he tells his mistress and model, Dot (a wry but empathetic Carmen Cusack). Danieley makes Seurat’s artistic distance vivid and moving in his rendition of the first act’s most striking number, “Finishing the Hat.” He’s so singularly focused on his work’s potential perfection that he can’t even uproot himself from his seat to continue it. Danieley’s second-act portrayal of the later George is a remarkable contrast, a looser, physically open glad-hander who knows how to negotiate the modern-art landscape’s networking and game-playing but who nevertheless shares his great-grandfather’s tendencies toward self-doubt. 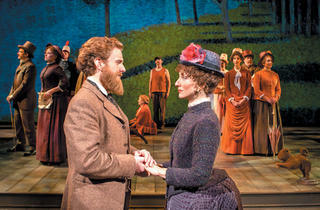 The key point of Griffin’s new production comes midway through Act II, when young George’s ancient grandmother, Marie (Cusack again, making hay of her second role as the daughter of Seurat and Dot), sings to him of “Children and Art.” As Sondheim and Lapine posit in that devastating number, its title indicates the two lasting legacies we can leave. The terrific lead performances are strongly supported by distinctive turns from the secondary players, particularly Ora Jones, Heidi Kettenring and Derek Hasenstab. Astonishing projection designs by Mike Tutaj help Griffin’s production achieve a forceful resonance between the two Georges’ creative compulsions, bridging the interior and exterior lives of the artists at this work’s heart.